Vango tents are designed to provide the optimum ratio of space, comfort and pack size for each pursuit and user that they have been created for. But sometimes we want that bit of extra room, protection from the wind or shade from the sun. That's where the Vango tent additions come in. A range of products designed to enhance your camping experience even further. What is a Tent Awning/Canopy? 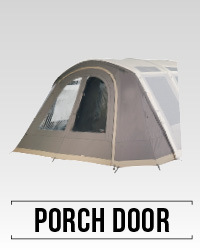 What is a Tent Porch Door? What is a Tent SkyShield? What is a Tent SkyLiner? 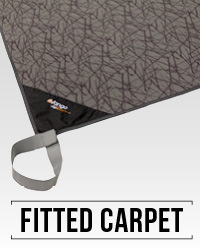 What is a Fitted Tent Carpet? What is a Universal Tent Carpet? Which tent additions fit my tent? Here are the guides detailing the additions that are compatible with the 2018 range of tents. An awning, or canopy, is a fully enclosed addition for your tent. Vango awnings are comprised of sides, front and door. 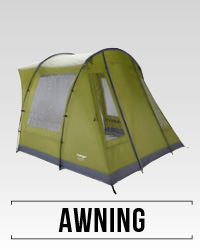 The awning provides an attached and enclosed addition to your tent, effectively an extra room giving you acres (ahem, please see product for actual dimensions) of extra space. Depending on the model of awning it will either be attached to the tent by zip or by webbing straps and clips. Designed to fit neatly to your tent, awnings are easy to pitch and attach. The most popular tents to add an awning to have specific products available. More universal canopies and awnings are available for many of our other tents too. An awning, or porch door, is a fully enclosed addition for your tent which are both designed with Diamond Clear Windows. The porch door creates an enclosed area in your front extension. Depending on the model of awning it will either be attached to the tent by zip or by webbing straps and clips whilst porch doors are attached to the extension pole/beam of the tent. Designed to fit neatly to your tent, they are easy to pitch and attach. The most popular tents to add an awning or porch door to have specific products available. More porch doors and awnings are available for many of our other tents too. 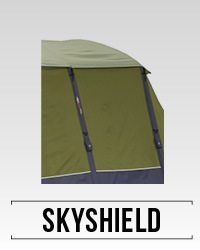 A SkyShield is a fitted cover for the roof of your tent . The Vango SkyShield system will extend the life of a tent by protecting the roof from UV degradation as well as keeping it clean. It provides an additional layer of insulation that will help keep the tent cooler in hot weather and warmer at night. 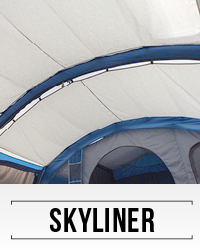 A SkyLiner is an internal fabric layer that attaches to the ceiling of compatible tents. The Vango SkyLiner provides a layer of air between your living space and the tent ceiling, ultimately reducing the effects of condensation and creating a thermal barrier in cold weather. They are made-to-measure and are supplied with pre-attached Skyhooks. SkyLiners attach to the ceiling inside your tent/awning by sliding onto the pre-fitted SkyTrack® system. Wall to wall carpet for the living area inside your tent. Makes the living area in your tent nice and cosy. The easy-care carpet provides comfort and warmth. It also helps to protect your groundsheet from excessive wear and tear. Not much. There's a handy logo in one corner to help you get it the right way round, it fixes into place so that it stays put, and it's got a waterproof backing to prevent any moisture seeping up. A carpet that will cover most of your living area. Like the carpet a rug makes your living area nice and cosy, providing comfort and warmth and helping to protect your groundsheet from excessive wear and tear. 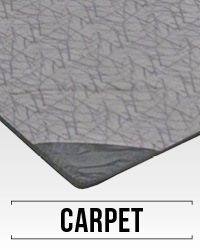 Universal Tent Carpets are a rectangle shape and fit a wide variety of tents. Rugs have a waterproof backing and come in a range of sizes so you can pick the optimum one for your needs. A tent footprint is a protective, waterproof barrier tailored to the footprint, shape your tent makes on the ground, when pitched. Protects the floor of your tent over the long haul, especially good for larger tents where you've got lots of "traffic" going in and out, or smaller tents that are being pitched in sandy or rugged terrain. What do I need to know about tent footprints? Footprints extent the life of your groundsheet, especially for users who have heavy traffic or pitch up on rough ground, they are also great for tents used by groups, such as DofE and Scouts, that get extensive use. Basically, tall steel or fibreglass poles. They have a pin at the top that will fit into a compatible eyelet on the tent door. Compatible with many tents with eyelets at the foot of the door. 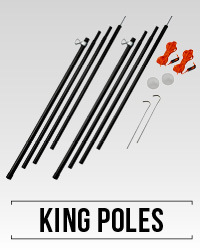 King poles hold the door open, creating a simple and hassle free canopy for the front of your tent and providing extra shelter for you and all the family. Transforms tent door into a handy sun canopy. It's a simple, lightweight shelter that can be used on its own (with walking poles or king poles), or attached to the front of a tent. 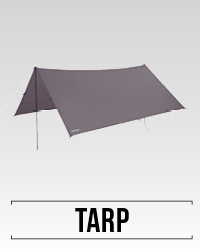 The Adventure Tarp can be used with a selection of our Adventure Tents. It is versatile and can be easily attached to the front of a tent or combined with walking poles/King Poles used as a standalone shelter. 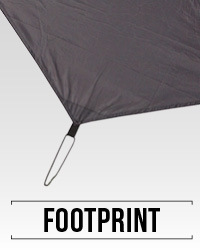 Provides extra cover for your kit or a simple shelter for when you want to travel light and fast. Guy lines, Powerplus Steel poles and waterproof polyester create a lightweight and strong barrier. 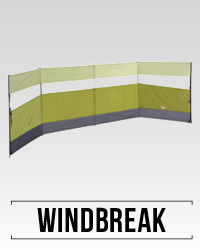 Windbreaks are suitable for the campsite, beach or any outdoor event. Stops the wind... come on!